1/3 of caregivers spend at least 20% of their own monthly budget on caregiving-related expenses such as medicine and medical supplies. If you think you might end up caring for Mom or Dad in their twilight years, be aware of an issue that catches many caregivers off-guard: The big hit to your own pocketbook. More than two-thirds of caregivers (68 percent) report providing financial support role, according to Northwestern Mutual’s 2018 C.A.R.E. Study. 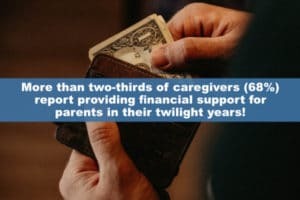 A third spend at least 20 percent of their own monthly budget on caregiving-related expenses such as medicine and medical supplies ($273), food ($159) and personal-care items ($151). About 41.3 million people age 15 or older provided unpaid eldercare during 2015 and 2016, according to the Bureau of Labor Statistics. As it stands, about a third of adults have taken on the role of caregiver, while 22 percent expect to in the future, the Northwestern Mutual study shows. Long-term care insurance can be an option. As with many types of insurance, the younger you are, the less expensive the policy typically is. If you wait until your health changes, you won’t be able to get it at any price. Waiting until you have an immediate need also is unwise. ‘Once you’re in the caregiving situation, your options will be more limited,’ Williams-Kemp said. Surely you do not want to leave your children in this situation. You can hope it does not happen to you, or you can get the insurance that pays for care. With the insurance you can pay for the care you want and will not have the trouble finding “room at the inn” that people on Medicaid now experience. Investigate with someone knowledgeable on local costs, and how to choose appropriate benefit levels. Remember that your income does not stop when care is needed, but expenses for fun and travel do. Interest on your nest egg can help as well. Only the shortfall after these needs to come from some other source, like insurance. Call TheLongTermCareGuy.com at (920) 884-3030 for a time to investigate options together. There are solutions for nearly any situation or health. Get a FREE Estimate from The Long Term Care Guy! Results will be emailed to you, but we guarantee that your email address will not be used for any spam or newsletters!